Fairfax's regiment was one of the three English regiments serving the States General8. The other's were Cutts' disappeared regiment and Columbine's (later 6th Foot). At first this one was the 'Irish' regiment of the Anglo-Dutch brigade, later counted with the English. Its first colonel was Daniel O'Brian Viscount Clare, who quit rather quickly. As an interim Lieutenant-Colonel Anselmne commanded. In 1675 Clare was succeeded by John Fenwick, who later turned Jacobite. At about this time the regiment quitted the designation 'Irish' and became 'English'. Under Fenwick the regiment participated in the failed 1676 siege of Maastricht. At this siege Fenwick was wounded and so for a time lieutenant-colonel Wisely commanded. After a quarrel with William III John Fenwick resigned. He was succeed by Wisely (or Wesley). In April 1677 the regiment fought in the Battle of Mont Cassel. In 1678 the regiment fought in the Battle of Saint Denis as 'Colonel Wesley's', and lost its lieutenant-colonel Archer. Major Hales was mortally wounded, and captains Charleton, Coleman, Floyd and Dupuy were also injured9. After the 1678 Peace of Nijmegen the regiment went to Grave, where it lay garrison for four years. In 1678 or 1680 its colonel Wisely drowned on his way to England, and was succeeded by Thomas Monk10, previously lieutenant-colonel of Astley's regiment (later 6th foot). In 1684 the regiment marched into the Spanish Netherlands and wintered in Mechelen. During the 1685 Monmouth rebellion James II asked for the six British brigades to come over. The three English regiments under Monk, Bellasis and Cannon came to late for the fighting. They did camp on Blackheath and later on Hounslow Heath, where they were reviewed by James II. This episode is linked with the 'Memoirs of Captain George Carleton', as its story is that he was Cornet George Carleton, who quitted this regiment on its stay in England and switched to English service. In September 1685 Monk's regiment participated in maneuvers near Palace het Loo11. On 14 August 1686 Monk's regiment was in camp near Nijmegen12. In 1687 Monk's regiment participated in the maneuvers near Dieren13. In 1687 James II asked for the return of the Anglo-Dutch brigade to English service, but the Dutch refused, and only a small part of the officers complied. After the death of Thomas Monk the colonelcy was conferred to lieutenant-colonel Thomas Tollemache (a.k.a. Talmash). Tollemache still commanded the regiment when it crossed to England in 1688 and landed at Brixham Key. On 1 May 1689 Tollemache became colonel of the Coldstream Guards and on that same day he was succeeded by Colonel Edward Llloyd14. The regiment quartered in Southwark till October and then sailed from Deptford and Greenwich to Plymouth. In December 1689 it marched into Cornwall. In spring 1690 the regiment embarked at Bristol and landed in Belfast on 20 April. From there it marched to Lisburn and Armagh, where it camped. On 1 July 1690 Lloyd's regiment fought in the Battle of the Boyne. As a consequence the road to Dublin was open and Lloyd's regiment went into garrison there. In April 1691 the regiment was stationed at Mountmelick. Under the overall command of Major Wood an operation to pacify the country-side was started from there. Lloyd's regiment participated with 200 men under Major Rider, there were also 100 men of Hamilton's regiment and 50 of Colonel Byerley's horse. On 4 May these troops marched forth in small parties and encountered some rebels. On 5 May one of these groups encountered two regular regiments of the enemy. According to the story 110 Foot and 34 horse destroyed the two regular regiments. 150 Irish were killed on the spot and 127 were taken prisoner. In June 1691 the regiment participated in the siege of Athlone. After taking the town Colonel Lloyd was appointed as governor and the regiment went into garrison there. After the victory of Aughrim Lloyd's regiment left Athlone and joined the siege of Limerick. After that the regiment sailed for England and landed at Highlake, near Chester on 29 December 1691. In February 1692 Lloyd's regiment embarked for Flanders. After the French Naval preparations in Normandy became known the regiment was however ordered back to England. It landed at Greenwich in early May and marched to the southern coast. In October it then marched to Plymouth. In 1693 the regiment the regiment participated in an expedition to Martinique and thn quartered in Berkshire and Buckinghamshire. In December 1693 it sailed for Oostende, and then wintered in Sluis. In May 1694 it marched to the vicinity of Gent and Tirlemont and wintered near Brugge. On 26 August 1694 its colonel Lloyd had died. 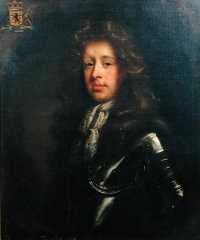 He was replaced by Thomas Fairfax by appointment of 6 November 169415. On 25 May 1695 the Fairfax regiment marched and was part of the force of the Prince de Vaudemont. After the siege of Namur the regiment marched to the vicinity of Nieuwpoort and wintered in Brugge. In 1696 the Fairfax regiment was occupied in operations to protect Brugge and Gent. In 1697 it was in a detachment that camped near Waterloo under Lieutenant-general Noyelles. After the war it landed at Greenwich and Dover in December 1697. In August 1698 it arrived in Dublin. From the 3 April 1699 list of troops that would be retained on the Irish establishment we see that Thomas Fairfax's regiment survived the 1699 disbandings. Fairfax's regiment started the War of the Spanish Succession in garrison in Ireland. On 5 February 1704 colonel Thomas Pearce was appointed to succeed Thomas Fairfax as colonel. On 22 May 1707 the Pearce regiment regiment sailed from Cork with three others. It arrived at Lisbon on 8 June and immediately marched to the frontier. It went into summer quarters at Estremos and in winter quarters in other frontier towns. In 1708 nothing much happened. In 1709 the Pearce first marched to Estremos and then to Elvas and the banks of the Caya where the Earl of Galway took up the supreme command. On 7 May a Franco-Spanish army under the Marquis de Bay was marching in the direction of Campo Mayor, and the alliance troops decided to attack it. In the subsequent battle of La Gudina, Galway's regiment; Barrymore's (13 Foot) and Stanwick's (later disbanded) as well as Brigadier-general Thomas Pearce were made prisoners of war. Pearce regiment acquited itself well and wintered in the Alentejo. In 1710 the regiment again started in the Alentejo. In autumn it marched across the Guadiana and on 4 October it arrived on the plains of Xeres de los Cabaleros near the river Ardilla in Spanish Estremadura. It was decided to storm this place on 5 October with three regiments under brigadier-general Stanwix. After the assault had only been underway a few minutes the governor parlied and surrendered his 700 men prisoners of war. Afterwards the army retreated to Portugal via the mountains of Orlor. In 1711 the regiment formed part of the army assembled at Olivenze in May. It passed the Guadiana on a pontoon bridge at Jerumencha and advanced, but the enemy retreated to Badajoz. The regiment was then engaged in capturing some small towns and levying contributions in Estremadura. In the summer of 1712 the regiment was camped on the plains of the Tarra. In autumn a suspension of hostilities was proclaimed by major-general Pearce. From Portugal the regiment proceeded to Gibraltar, where it would remain in garrison for 15 years. 8) For Fairfax's regiment see (unless otherwise stated): Historical Records of the British Army London 1837, The Fifth regiment of Foot, or Northumberland Fusiliers. 9) Hollandse Mercurius for 1678, page 184 has a list of casualties of the English at Saint Denis with Archer's death. 14) In de Europische Mercurius for 1691 page 27 is a January 1691 list of troops that reflects Babington's, Lloyd's and Cutts' regiments apart from the English regiments and with a different strength. 15) From an October 1696 list which has the Foot regiment of Colonel Fairfax's, late Colonel ed. Lloyd's we can conclude that Lloyd was succeeded by Fairfax.